A good portion of most b’nai mitzvah training is, frankly, meshugah. This is how it’s done (mostly): Jews take a pre-teen or early teen, make them sing a bunch of stuff in a language they don’t understand, and then ask them to do all this in front of family, friends, and congregation. The boys squeak most of the time (we’ve rigged this event to occur just as their voices are breaking) and the girls sing too softly. A goodly percentage of teenagers sing off key. The last verse of Adon Olam is sung, and the community celebrates. Our young’un is now an adult. It’s the Jewish version of sending a child off into the wild to fight with bears and suchlike. I know cantors and rabbis who dread the whole experience. But I’ve learned to rely on a strange fact. Almost every time, no matter the child, grace will descend and we will both understand the purpose of b’nai mitzvah training. We will ask who we are as Jews, and what Judaism can or should mean relative to the terms “human” and “humanity.” We’ll ask who and what God might be and why we pray (if we do). There are no restrictions or right answers. We will learn something together. We will grow up – together. Recently, my little congregation has adopted alternative approaches to b’nai mitzvah training. We’ve retained the religious service track, and it’s still the most popular of three. The culminating experience, leading a Shabbat service, is beautiful despite squeaks and shyness and minor keys because we enjoy demonstrating communal pride in our teens. We also have a Jewish learning track, where the teen in question follows up on a specific area of interest. Just now I’ve got one student, Bryston Spivock, who has been learning Chinese. He also happens to love history. We’ve joined these two interests: Bryston is currently studying the history of Jews in China and will present an educational program to the congregation as his capstone experience. We also have an intensive tikkun olam track which involves super-extensive hours of social action combined with a learning component. One of my other students is on that track — Bryston’s sister, Emory. Emory is an animal rights activist who has won awards with her work protecting waterfowl. She and I are making our way through texts on animal treatment in both the Tanakh and in rabbinic texts. At our last session, we were looking at biblical commands on the treatment of animals, particularly Exodus 23:5 and Deuteronomy 22:4, which enjoin us to relieve animals of onerous burdens even if we do not like the animal’s owner, do not know its owner, or even if it is ownerless. Emory knows a lot about animal suffering. She knows about the black market that buys and sells products made from endangered species. She knows about the ways in which turkeys and hens are forced to live miserable, even unnatural lives before being slaughtered. Emory volunteers for hours each week knowing that she will be unable to prevent much of this sort of cruelty. I asked her: Where did God fit into the picture she was describing? She struggled to define God’s role in her world. From Emory’s perspective, most animal life is utterly helpless in the face of human agendas. God seems more or less out of the picture. At a loss, she finally asked me what I believed. Typically, when my teens ask me what I believe, I remind them that we are studying together to find out what they believe. But this time I abandoned my usual pedagogical tricks. “What do I believe?” I asked. I told Emory that answers are elusive and fragile. What I believe today I question tomorrow. When I sing, I am filled with God’s presence. When I am silent and observe the world and its pain and sorrows, I often feel isolated, anxious, even abandoned. God permeates, signals, speaks to me and comforts me. God is absent, unreachable, a creation of my longing and my hope. Sometimes, I wonder if the divine is not my effort to imagine compensation for humanity’s many inhumanities. More times, I am rejoicing in that which feels like God’s grace, riding on the crest of waves of affection and love and joy and compassion I see in those around me. People acting goodly seem godly to me. At our next Friday night service, Emory and I caught each other in the hallway to the fellowship hall. “I’ve been thinking a lot about our last conversation,” I said. “Let’s talk some more about it at our next lesson, okay?” I asked. I will tell Emory then why she has been so much on my mind since I told her what is on mine. In a way, what she does and who she is teaches me to believe. It is a terrifying story, and beautiful. In one moment, we are exalted beyond measure, standing at Sinai, amazed at the gift we have received. We shout out joyfully; naaseh v’nishma, “we will do and we will hear.” We will do and then we will understand. We leave those heights for what seems a litany of miserable encounters, terrible challenges. We endure a new sort of darkness where we must wrestle as our ancestor Jacob once did – with a Divine opponent we cannot understand, an opponent who gave us the name Israel, God-wrestlers. There are internal, human enemies, as well. Korach, for example, the lead figure in this week’s Torah portion. He is, it seems, the quintessential rebel, the brazen upstart. A Levite himself, he challenges Moses and Aaron: Who gave you the right to rule? “You have gone too far! All the community is holy – all of them, and the Lord is in their midst. Why do you raise yourselves above the Lord’s congregation?” (Numbers: 16:3). Moses falls on his face, prostrating himself and calls for God to decide. Aaron, as representative of the Kohanim, the priesthood Korach seems to covet, is to burn incense in his fire pan. Korach and his followers are to do the same. The Lord appears, and after Moses warns the Israelites to stand aside from the band of rebels, the earth opens and swallows Korach and his family whole. A blazing fire comes forth from the Lord and consumes all two hundred and fifty followers. Imagine the scene: the charred fields, the screaming, and the cries of grief. More than two hundred and fifty lives had been taken in mere seconds. The earth convulsed, fire immolated human beings. Elazar must traverse the smoking earth to find ritual items used by Korach’s followers for a holy purpose – to make an offering to God. Who is given the task of cleaning those fire pans and beating them into a different form? How does it feel to hammer the copper flat, breathing in the acrid air, hearing the sounds of a terrified people? The tears must have stung as they fell – no matter whose side you were on, what had happened was a disaster. Once again, we lose our own. According to many commentaries, God appears to have meant for the newly plated altar to remind people of the dangers in arrogance or presumption – this God seems to think such a deterrent is a useful way of regulating the relationship with the people God claims to have chosen. Korach and his band were rebels of the highest order, claiming a purity and holiness the people had hardly begun to achieve. To criticize Moses and Aaron out of envy or arrogance was divisive and destructive. Korach and his followers were trying to tear everything apart; they succeeded in destroying themselves. The fire pans are remade into a warning. Could anyone think to challenge God’s authority again? They need only look at the altar to be reminded of the potential costs. Perhaps God has yet to learn that humanity cannot be so controlled. Perhaps some of the Israelites watched the altar glitter in the desert sun and came to yet other conclusions. Korach must have been remembered differently than God may have expected, for twelve of our psalms are attributed to the sons of Korach. Midrash claims that the priest and prophet Samuel was one of Korach’s descendents. Somehow, the people did not allow Korach to be erased from memory or history. Today’s parsha, which tells his story, is given his name. Neither do all commentaries agree (but if they did, that would be a violation of tradition…). Rabbi Naftali Zvi Yehuda Berlin (1817-1893) suggested that the two hundred and fifty leaders who offered up incense on the fire-pans were well-intentioned Israelites who simply wanted to serve God by performing priestly duties. “They longed to do the will of God,” he said, “and gave their lives for the love of God.” Rav Abraham Isaac Kook (1865–1935), the first Ashkenazi chief rabbi of the British Mandate for Palestine, and one of the 20th century’s foremost rabbis, claims that the fire pans were made part of the altar in order to remind us of the dangers of complacency and corruption. Legitimacy – even holiness – can emerge from challenging religion. One must be grateful for the fact that consensus continues to elude us where Tanakh is concerned. We no longer conceive a wrathful and authoritarian God. Our own history has demonstrated that such a God cannot be worshipped. Who knows? Maybe God had to learn that lesson, too. Maybe God demanded those platings to be placed around the altar in order for God to be reminded of the essential conditions of relationship between human and divine. The plating was set against the altar so that we remember Korach’s challenge, and what it cost him and his followers, the text says. 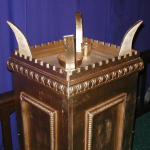 But consider: This shining metal encased the altar on which the Israelites made their offerings. We pray, and not infrequently, without commitment or belief, struggling with rage and rebellion. Offerings on that altar were made with the thin, hard shell of resentment present and accounted for. God, Godself, insisted that the Israelites to wrap their holy prayer in reminders of their holy rebellion. Perhaps because God is acknowledging that our relationship is complex, marked by alternating states of surety and skepticism. Trust and acceptance give way to doubt and agitation, and vice versa. The line of Korach endures, as it should.